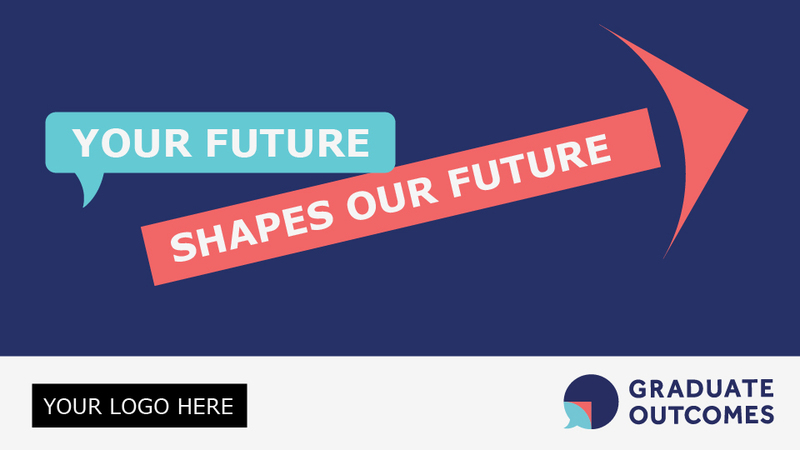 To coincide with the launch of the survey, we’ve released our engaging animated video which provides graduates with a snapshot of what the survey is about and why they should take part. This will be a key resource for you to share on social media and in all of your communications. We’ve provided it in English and Welsh. Below you’ll find the links to the video on YouTube and the embed HTML codes so you can add it to your own webpage about Graduate Outcomes. Events such as graduation ceremonies provide an engaging opportunity to capture contact details and establish some brand awareness of Graduate Outcomes. Using roller banners is a quick and cost-effective way of doing this so we’ve created two standard sized single roller banner templates for you to use. We are making these available in *.indd and *.pdf format, to allow you to customise them regardless of the software you have access to. Original artwork in Adobe InDesign *indd format is included in these zip files, should you wish to develop your own concepts. Each design is available in both English and Welsh. As printers vary, please ensure the artwork is sized to the required specification before printing. We have developed four promotional concepts. Three of these concepts appeal to different motivations graduates might have for completing the survey; the fourth provides information about the survey. We anticipate you will use whichever designs you feel will resonate best with your graduates. For each concept, we have produced digiscreen slides (at 16:9 and 4:3), and social media graphics - although these are flexible enough to be put to other purposes. We are making these available in *.ai, *.pdf and *.jpg format, to allow you to customise them regardless of the software you have access to. Original artwork in Adobe Illustrator *ai format is included in these zip files, should you wish to develop your own promotional concepts. Each design is available in both English and Welsh. DLHE data plays a very significant role in supporting student choice and informing public discussion on the value of higher education. Design 1 encourages graduates to complete the survey to ensure their activities and views fit into this high profile data set. The design uses national statistics drawn from the latest DLHE; you could choose to pull out data about your provider, or about specific courses. This design focuses on graduate's loyalty to their provider as a reason to encourage engagement with the survey. 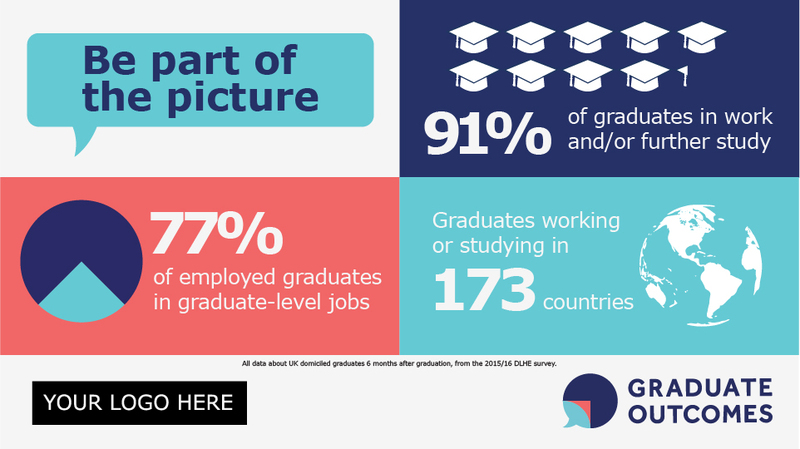 This design play on the familiar 'You said, we did' slogan to emphasise how information about graduates' post-study activities can help improve the student experience for future generations. There is no version of this design that can be used as is; you would have to customise it with your own you did/we did statements which you could do in Adobe Illustrator, Adobe Acrobat, or in PowerPoint using the hi-res jpg we have supplied. We have deliberately produced three designs that are high-level and eye-catching - that raise awareness of Graduate Outcomes, but don't provide significant detail. The fourth design supplements the others by providing key information about the Graduate Outcomes survey. 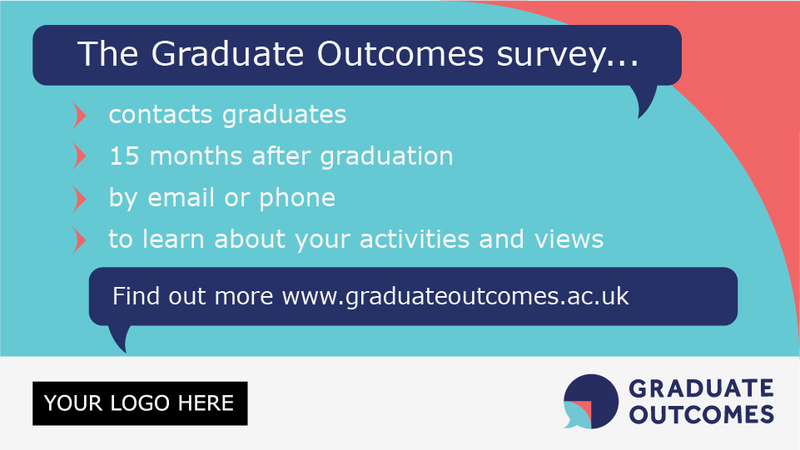 One version of the design gives the www.graduateoutcomes.ac.uk web address which points to our new graduate-focused website with information about the survey on it. The other version of the design leaves this box blank to allow you to add your own call to action. We have developed a co-brandable, html email template should you wish to use this to promote the survey and encourage graduates to check their contact details. This template can be imported into a range of mail clients. To recreate this design using MailChimp, download the original design files and follow these design guidelines. We have also produced a draft email template (in Microsoft Word format) that providers can use when asking their students/graduates to update their contact details.